LONDON--(BUSINESS WIRE)--According to the global vision processing unit market research report released by Technavio, the market is expected to accelerate at a CAGR of more than 20% during the forecast period. The increasing application of VR is one of the key drivers for the vision processing unit market. This research report titled ‘Global Vision Processing Unit Market 2018-2022’ provides an in-depth analysis of the market in terms of revenue and emerging market trends. It also includes an up-to-date analysis and forecasts for various market segments and all geographical regions. In 2017, the consumer electronics segment accounted for more than 83% of the vision processing unit market share and is projected to decline to over 82% by 2022, exhibiting almost 1% decrease in market share. The rapid adoption of drones is an emerging trend in the vision processing unit market. Drones are widely used for surveillance and rescue, emergency response, high-altitude imaging, forest fire monitoring, flood mapping, humanitarian aid, product delivery, oil spill monitoring, Internet connectivity, and photography. They are also used for environmental monitoring and mapping, soil moisture imaging, hyperspectral imaging, plume dispersion and tracking, in-site atmospheric monitoring, and aerosol source determination. 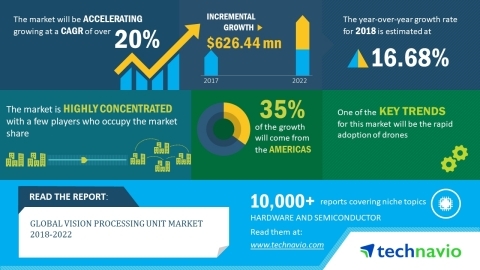 According to the global vision processing unit market research report by Technavio, the market is expected to accelerate at a CAGR of over 2022.